Fossil fuels or mineral fuels are hydrocarbon fuels found within the top layer of the Earth’s crust. 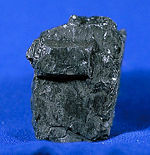 They range from highly volatile materials, such as methane, to liquid petroleum, to solids composed of almost pure carbon, such as anthracite coal. The term "fossil fuels" is based on the widely accepted theory that they were formed from the fossilized remains of dead plants and animals, during exposure to heat and pressure in the Earth's crust over hundreds of millions of years. This process of formation is known as the biogenic theory. An opposing theory, called the abiogenic theory, maintains that the more volatile hydrocarbons, especially natural gas, were produced from nonliving materials. Fossil fuels are of great importance because they can be burned (oxidized to carbon dioxide and water), producing significant amounts of energy. They are also the main source of raw materials for the petrochemical industry. Fossil fuels are considered non-renewable resources because they take millions of years to develop and reserves are being depleted much faster than new ones are being formed. Concerns about fossil fuel supplies have been among the reasons for regional and global tensions and conflicts. The production and excessive use of fossil fuels have also raised environmental concerns. It is argued that excessive production of carbon dioxide, a greenhouse gas, from burning fossil fuels contributes to global warming. A global movement toward the generation of renewable energy is therefore under way to help meet increased energy needs. The origin of fossil fuels has been explained in different ways. Most petroleum geologists favor what is called the "biogenic theory," which holds that fossil fuels were formed from the remains of living organisms. (This view is the basis for calling the fuels, "fossil fuels.") An alternative theory, called the "abiogenic theory," holds that fossil fuels were formed from nonliving matter by mainly inorganic processes. The biogenic hypothesis for the formation of petroleum was first proposed in 1757, by Russian scholar Mikhail Lomonosov. Since then, it has undergone several modifications. According to the biogenic theory, petroleum was formed from the preserved remains of prehistoric zooplankton and algae that settled to the sea (or lake) bottom in large quantities under anoxic conditions. Over geological time, this organic matter, mixed with mud, was buried under heavy layers of sediment. The organic matter then underwent chemical changes—through the action of heat and pressure or the action of anaerobic bacteria—to form a waxy material called kerogen, which is found in various oil shales around the world. As the source rock was buried deeper, overburden pressure raised temperatures into the oil window, between 60 and 120°C, in which the kerogen molecules were broken down into the straight-chain hydrocarbons that make up most of petroleum. Once crude oil formed, it became very fluid and migrated upward through the rock strata. This setting is called oil expulsion. Eventually it was either trapped in an oil reservoir or oil escaped to the surface and was biodegraded by soil bacteria. Any oil buried deeper entered the gas window of 120°C to 220°C and was converted into natural gas by thermal cracking. Thus, below a certain depth, the theory predicts that no oil will be found, only unassociated gas. If it went even deeper, even natural gas would be destroyed by high temperatures. By contrast, it is thought that coal was formed from the remains of terrestrial plants. In support of this view, many coal fields date to the carboniferous period. According to the theory of "abiogenic petroleum origin," natural petroleum was formed from deep carbon deposits, perhaps dating to the formation of the Earth. The ubiquity of hydrocarbons in the Solar System is taken as evidence that there may be a great deal more petroleum on Earth than commonly thought, and that petroleum may originate from carbon-bearing fluids that migrate upward from the mantle. Various abiogenic hypotheses were first proposed in the nineteenth century, most notably by the Russian chemist Dmitri Mendeleev and the French chemist Marcellin Berthelot. Since then, these hypotheses have lost ground to the dominant view that petroleum is a fossil fuel. Abiogenic hypotheses saw a revival in the last half of the twentieth century by Russian and Ukrainian scientists, and more interest was generated in the West after the publication, in 1999, of The Deep Hot Biosphere by Thomas Gold. Gold's version of the hypothesis is based partly on the existence of a biosphere composed of thermophile bacteria in the Earth's crust, which may explain the existence of certain biomarkers in extracted petroleum. Although the abiogenic theory, according to Gold, is widely accepted in Russia, where it was intensively developed in the 1950s and 1960s, the vast majority of Western petroleum geologists consider the biogenic theory of petroleum formation scientifically proven. Although evidence exists for the abiogenic creation of methane and hydrocarbon gases within the Earth, it is argued that they are not produced in commercially significant quantities, and essentially all hydrocarbon gases that are extracted for use are thought to be biogenic in origin. Moreover, it is argued that there is no direct evidence to date of petroleum (liquid crude oil and long-chain hydrocarbon compounds) formed abiogenically within the crust, which is the essential prediction of the abiogenic petroleum theory. The abiogenic origin of petroleum (liquid hydrocarbon oils) has recently been reviewed in detail by Glasby, who raises a number of objections to the theory. 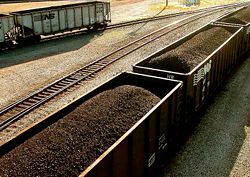 The use of coal as a fuel predates recorded history. Semisolid hydrocarbons from seeps were also burned in ancient times, but these materials were mostly used for waterproofing and embalming. Commercial exploitation of petroleum, largely as a replacement for oils from animal sources (notably whale oil) for use in oil lamps began in the nineteenth century. Natural gas, once flared-off as an unneeded byproduct of petroleum production, is now considered a very valuable resource. Heavy crude oil, which is very much more viscous than conventional crude oil, and tar sands, where bitumen is found mixed with sand and clay, are becoming more important as sources of fossil fuel. Oil shale and similar materials are sedimentary rocks containing kerogen, a complex mixture of high-molecular weight organic compounds which yields synthetic crude oil when heated (pyrolyzed), but they have not yet been exploited commercially. Prior to the latter half of the eighteenth century, windmills or watermills provided the energy needed for industry, such as milling flour, sawing wood, or pumping water and burning wood or peat provided domestic heat. The wide scale use of fossil fuels, coal at first and petroleum later, to fire steam engines, enabled the Industrial Revolution. At the same time, gas lights using natural gas or coal gas were coming into wide use. The invention of the internal combustion engine and its use in automobiles and trucks greatly increased the demand for gasoline and diesel oil, both made from fossil fuels. Other forms of transportation, railways and aircraft, also required fossil fuels. The other major use for fossil fuels is in generating electricity. Fossil fuels are also the main source of raw materials for the petrochemical industry. 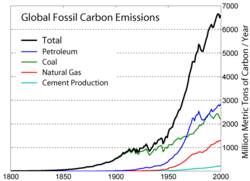 Global fossil carbon emission by fuel type, 1800-2000 C.E. The principle of supply and demand suggests that as hydrocarbon supplies diminish, prices will rise. Therefore, higher prices will lead to increased alternative, renewable energy supplies, as previously uneconomic sources become sufficiently economical to exploit. Artificial gasolines and other renewable energy sources currently require more expensive production and processing technologies than conventional petroleum reserves, but may become economically viable in the near future. Different alternative sources of energy include alcohols, hydrogen, nuclear, hydroelectric, solar, wind, and geothermal. The combustion of fossil fuels produces greenhouse gas emissions, as well as other air pollutants, such as nitrogen oxides, sulphur dioxide, volatile organic compounds, and heavy metals. The electricity sector is unique among industrial sectors in its very large contribution to emissions associated with nearly all air issues. Electricity generation produces a large share of Canadian nitrogen oxides and sulphur dioxide emissions, which contribute to smog and acid rain and the formation of fine particulate matter. It is the largest uncontrolled industrial source of mercury emissions in Canada. Fossil fuel-fired electric power plants also emit carbon dioxide, which may contribute to climate change. In addition, the sector has significant impacts on water and habitat and species. In particular, hydro dams and transmission lines have significant effects on water and biodiversity. Combustion of fossil fuels generates sulphuric, carbonic, and nitric acids, which fall to Earth as acid rain, impacting both natural areas and the built environment. Monuments and sculptures made from marble and limestone are particularly vulnerable, as the acids dissolve calcium carbonate. Fossil fuels also contain radioactive materials, mainly uranium and thorium, that are released into the atmosphere. Burning coal also generates large amounts of bottom ash and fly ash. These materials are used in a wide variety of applications. An example of such regulation in the U.S. is the implementation of policies by the EPA to reduce airborne mercury emissions. In 2011, EPA issued the Mercury and Air Toxics Standards (MATS) regulation to reduce emissions of toxic air pollutants from coal- and oil-fired power plants. In economic terms, pollution from fossil fuels is regarded as a negative externality. Taxation is considered one way to make societal costs explicit, in order to "internalize" the cost of pollution. This aims to make fossil fuels more expensive, thereby reducing their use and the amount of pollution associated with them, along with raising the funds necessary to counteract these factors. Although European nations impose some pollution taxes, they also give billions of subsidies to the fossil fuel industry, offsetting the taxes. ↑ Irene Novaczek, Canada's Fossil Fuel Dependency Earth Action PEI, September 2000. Retrieved April 17, 2019. ↑ Thomas Gold, The Deep, Hot Biosphere (Copernicus Books, 1999, ISBN 0387985468). ↑ Sherwood Lollar, et al., Abiogenic formation of alkanes in the Earth's crust as a minor source for global hydrocarbon reservoirs, Nature 416 (2002):522-524. ↑ G.P. Glasby, Abiogenic origin of hydrocarbons: An historical overview, Resource Geology 56: 83-96. ↑ Zayn Bilkadi, Bulls From the Sea Retrieved April 17, 2019. ↑ Max W. Ball, Douglas Ball, Daniel S. Turner, This Fascinating Oil Business (Indianapolis, IN: Bobbs-Merrill, 1965, ISBN 067250829X). ↑ Oil Sands Global Market Potential 2007. Retrieved April 17, 2019. ↑ Environment Canada, Electricity Generation. Retrieved April 17, 2019. ↑ What EPA is Doing to Reduce Mercury Pollution, and Exposures to Mercury EPA. Retrieved April 17, 2019. All links retrieved April 17, 2019. Williams, James L., A.F. Alhajji. The Coming Energy Crisis? WTRG Economics. Parfit, Michael. Future Power: Where Will the World Get Its Next Energy Fix? National Geographic. Gold, Thomas. The Origin of Methane (and Oil) in the Crust of the Earth. Internet Archives. This page was last modified on 17 April 2019, at 22:28.